All living plants age and eventually die. The only exceptions are plants that are man-made from plastic or other materials. The aging process, called senescence, begins after the plant achieves reproductive maturity and ends when the plants dies. Senescence is an inevitable component of plant cultivation, so gardeners should recognize and understand the process, and appreciate its benefits. There are several kinds of senescence. Whole Plant Senescence occurs when the entire plant dies after seed production. This occurs with annual and biennial plants, and also with monocarpic plants, e.g., the Century Plant (Agave Americana), which can grow for several years before producing seeds. The benefits of this kind of senescence include genetic diversity (each seed cycle combines genes from different plants) and increased survivability (the plant uses it resources for producing seeds, rather overwintering). Sequential Senescence is typical of perennial plants, in which the leaves age and die, but the main shoots continue to produce new buds and leaves. This is characteristic of woody perennials, i.e., shrubs and trees, which build their roots and aboveground structure year after year, and thus increase their abilities to produce seeds and compete with other plants. A good example is the apple tree, and many other fruit-bearing trees. The tradeoff is less genetic diversity for the tree itself, although achieve genetic diversity through its fruits. 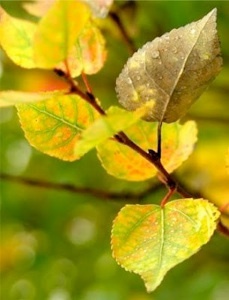 Still, the tree is more vulnerable to rapid environmental changes and attacks of insects or diseases. Shoot Senescence occurs with certain plants that die to the ground after flowering and fruiting, but retain their belowground stems and roots, which produce new shoots in the following season. Examples of such plants include the banana and the gladiola, as well as virtually all other bulbous plants. Synchronous Senescence is controlled by environmental factors. In this process, temperate deciduous trees drop their leaves in response to seasonal changes in the temperature, typically as in late autumn. At this period, the leaves’ green chlorophyll decomposes, revealing the leaves’ carotenes, which may be yellow, orange or orange-red. In California, we look for fall color in elms, many Japanese maples, Chinese Pistach, Liquidamber, Bradford pear, flowing dogwood and others. The living fossil Maidenhair Tree (Ginkgo biloba) is noteworthy because in the fall its leaves change from green to saffron yellow, and then all fall not quite simultaneously, but within a short period. Woody plants also will self-prune during the growing season: leafy shoots that are not growing well die off, and the plant re-directs its nutrients to other shoots. I see this impressive self-regulatory function mostly with interior shoots that may lack sufficient exposure to sunlight. Similar, but less visible self-pruning also occurs with roots. Gardeners need to be alert to dieback that can occur in addition to the natural processes of senescence. Such diebacks could result from controllable environmental impacts, from temperature, wind or sun exposure, insects, diseases, or herbivores; water shortages; or nutritional deficiencies. The first step in correcting a problem is analyzing its cause. This entry was posted in Essays 2014, Spring Quarter and tagged Cultivation, Drought, Fruit Trees, Trees by tomkarwin. Bookmark the permalink.